We emphasize the foundational capacity in students to gain knowledge and apply it based on their individual abilities. A learning focus helps students understand how they grasp concepts and develop a specific world vision. With a strong motivation to learn, they’ll experience a self-reinforcing drive to grow. This will directly influence their level of performance and may raise their ranking. Competition keeps the talent concentrated on overcoming others, while collaboration encourages unifying various skills sets for a collective cause. We create services designed to foster students’ sense of understanding their skill gaps and strengths. They learn to appreciate the talent in others and how to leverage those differences to achieve a common goal. Great leaders recognize that they must build on their strengths and build teams around their weaknesses. They see themselves as creative problem solvers and unique based on their own natural abilities and experiences. Students today more than ever need to embrace their own inner strengths and recognize that their weaknesses are someone else’s strengths. In order for us innovate, we have to appreciate our strengths, appreciate the strengths of team members and most importantly recognize that fitting in adds little or no value. Resilience is a necessary quality for our youth. Making mistakes and failing is part of the journey in innovation that cannot be predicted. Student today face new challenges in a digital world that adores the quick fix to problems. They need maturity to accept there are many routes to solutions; sometimes their solutions are not the best and may need revision. Our services reinforce their sense of inner strength so students can build their internal compasses and achieve the perseverant mental state needed to consider alternatives towards success. When students experience a sense of vision, their amazing qualities manifest. 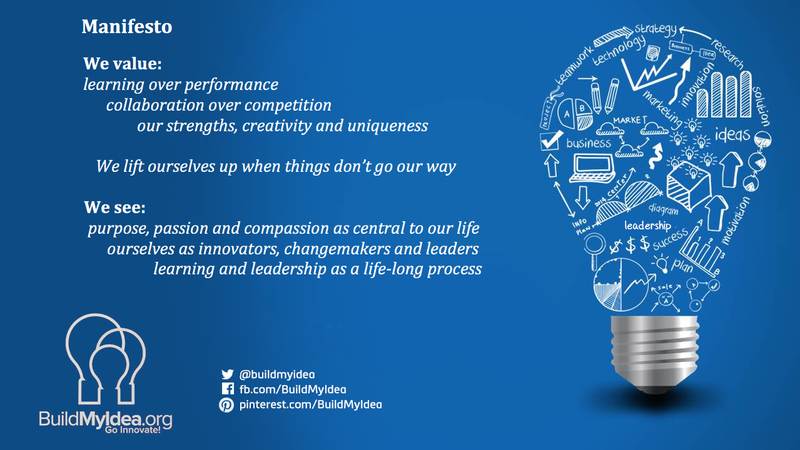 BuildMyIdea.org is uniquely positioned to help learners peer deep into their desire and talents. Once achieved, students strengthen with purpose and focus on how to see it come to life. Rather than an at-all-cost approach, our services guides learners to rise to fulfill their purpose without sacrificing dignity. Learners can realize that compassion and service for humanity are not at odds with living a better quality of life. Rather, passion and compassion can unite to enable students to develop purpose and live their dreams. BuildMyIdea.org teaches learners to see with a long-term perspective. Upon completing our programs, we intend for students to continue gaining knowledge and deeper understanding of their potential. Throughout our learning environment, we hold steadfast to the principle: never stop learning.